Synopsis : Ariba Eiji (29 years old with intimidating eyes), a corporate slave whose only hobbies are video games and manga, gets through life by spending his time off relaxing at net cafes. One day, he happens upon Minamisato Karen (a 15 year old high school girl) and ends up scolding her. This leads to her warming up to the 29 year old Eiji...! Not only that, Eiji's little sister (a lazy middle schooler), childhood friend (a nosy ex-girlfriend), and his subordinate (a cool and serious girl) are also becoming interested in him. Love is coming at him from every direction! Juggling between his work and his newly developed ventures into romance, will Eiji's peaceful days ever return? this looks like an interesting series. I give you my upvote. Upvote but I do wish there wasn’t the little sister aspect. I guess this is a cultural differences thing. It could be cute/dramatic if he's dealing with girls who have a crush on him and trying not to hurt their feelings/ let them down easy etc. If he's perusing them, too creepy. 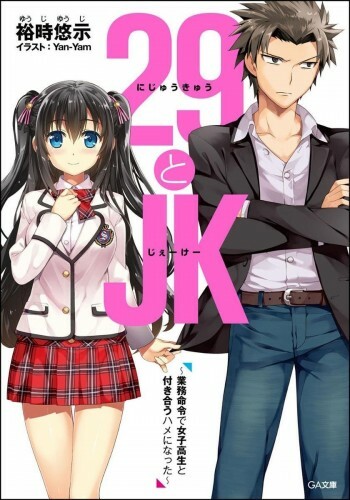 I've read this one, it never felt like he was pursuing any of the "JK's". In fact we are introduced to the girl he used to go out with in the first few chapters. Of course, that doesn't mean that at least ONE of the JK's have intentions towards him.